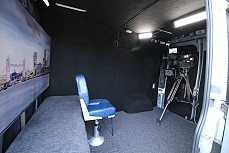 Stryder TV: mobile TV studio. An added benefit is that as it causes minimum disruption with the guest not having to go to a studio, it encourages a more representative cross section of guests who might not otherwise be available due to child commitments or time pressures. 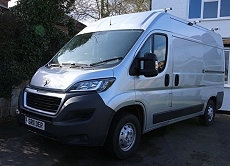 The high roof van is insulated and carpeted throughout. It is self powered and has a 65” 4K HDR TV. It carries a full ENG camera kit including sound and lighting and in addition it has a full pre-rigged lighting setup. In operation it is totally silent so it could also be used for Radio, Off Tube commentary, a TV gallery, an edit suite or a production office. The 65” 4K monitor can be quad split into 4 full res HD monitors. The 65” 4K HDR TV can display a city skyline, a broadcasters logo or any appropriate picture. Transmission can be via our LiveU or Aviwest, or if the budget permits by using our traditional Ku band satellite truck. IFB can be via the LiveU or Aviwest but it also carries a mobile phone talkback system for when it all gets a bit manic in MCR. … and it is still a full ENG crew deployable with LiveU outside the van if that is what is required.